+++ In the fifth round, the first four teams won! Only E 5 was overcome by a strong third team from Dolle Toren Leuven. Despite missing some players from the stem team, Europchess 1 outclassed Namur 1 with a clear 6.5-1.5 victory, not losing a single game. Paula Gitu was the first to finish on board 8 against Vincent Engelen (1815). She got a nice initiative with White from the opening and stopped Black’s king from castling. After having damaged the pawn structure in front of it she carried out a quick and deadly attack with the heavy pieces: 1-0. On the second board, Jan Bednarich entered a complicated position with White against Sebastien Marte (2145). Although he had gained some edge, he settled for a draw, as things were already shaping up nicely on other boards: 1.5-0.5. Matija Šušković had to defend carefully with Black on board 3 against the dangerous Ivan Werner (2118). In the middlegame his opponent didn’t find a way to prove compensation for his pawn sacrifice and suffered a defeat, when he over-pressed. Similarly, Georgi Tomov had to give up a pawn with Black on board 1 to beat off Victor-Angel Bolzoni’s (2248) dangerous initiative. Once White exchanged queens, however, Black had all the chances with his Bishop pair, and soon enough Georgi took advantage of a bad error to promote a pawn and chalk up another victory for Europchess: 3.5-0.5. At this point, Benjamín Alberola Mulet accepted a draw offer on board 6 from Pierre Vernimmen (1907). He had gained an advantage with White thanks to a pawn break through the centre in a closed position, but his opponent defended doggedly and managed to hold an endgame a pawn down thanks to his Bishop pair. Pere Moles Palleja fought a complicated battle with various material imbalances with Black against Michael George (1930) on board 5. Once the smoke cleared after the time control, it turned out Black didn’t have more than a draw in a queen endgame. Finally, Milan Beles emerged with a nice edge out of the opening with Black against Damien André (1876) on board 7. He methodically made progress in an endgame with opposite-colour bishops to seal a memorable victory for himself and the team. This impressive performance made the first team the leader of Division 2A at half-season. Will we keep the lead this year also in the next half? Playing the division-newcomer Aalst 1, the second team showed its teeth in a tough match. On the sixth board, Mark Ouaki quickly won with White against Jovanni Van Wijnendaele (1661). After having destroyed Black’s castling position, he won a piece when his opponent overlooked a tactical threat, causing immediate resignation. Mattias Johansson on the second board followed with a nice White win against Ritsaart Willockx (1925). Having established a firm pawn centre, Mattias got the initiative at the queenside. When Black misplaced his knights, our team captain pocketed first a pawn and then a full knight: 2-0. On board 5, Kristian Frederiksen got a slight advantage with White against Frans De Smet (1799). However, as the position was safely blocked, the players agreed to share the point. Johannes Bertram on board 4 had also gained a better position with White against Berwout Heymans (1833). In a complicated middlegame, Johannes missed strong continuations, and after the end of the zeitnot phase, a queen’s ending was reached with Johannes being a pawn down, but good chances for a draw. Unfortunately, Johannes blundered and let Black exchange the queens, which led to a won pawn ending: 2.5.-1.5. At this stage, the eyes turned (again) to Szymon Pozimski, facing with Black Freddy Vanhee (1883). White was able to queen a pawn with a problem-like combination. But in the ensuing asymmetrical material (Queen plus rook vs. rook, two knights and two connected passed pawns), Szymon showed masterly play, picking White’s rook for free: 3.5-1.5! In the final game, also Martin Müller could add a victory on the top board against Bart Vermeiren (1982). Having suffered from a weak king position and a lack of space after the opening, he bounced back once the queens were off the table. He snatched a pawn and finally arrived at an ending with two pawns plus knight vs. pawn plus bishop. While White could have shown more resistance with a stalemate trick, he allowed an exchange of the minor pieces which led to an easily won pawn ending. With this fine 4.5-1.5 victory, E 2 has solidified its position on rank 6 in the middle of the table in Division 3 D.
Europchess 3 continued its winning streak with a clear 3-1 against Namur 4. First, José María Ramos Florido put pressure on Alfred Mathieu (1721) with White. Black did not want to castle, fearing José María’s kingside attack. 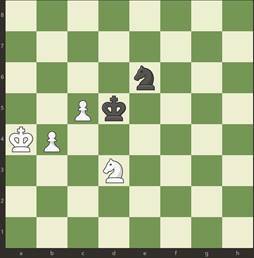 However, with his king remaining in the centre, he first lost a piece and then the game. Helge Schröder on board 3 with Black against Eric Balon (1660) traded a piece for two pawns and some compensation. However, as this bargain did not pay off in the long run, he had to give in. On the fourth board, Julien Peyrebrune outplayed Bernard Moens (1640) with White. He first won a pawn and then a full piece: 2-1. Finally, Luis Parreira on the 1st board outclassed Thierry Lenoir (1737) with Black. Although he had lost a pawn after the opening with no compensation, he came back mightily. Good attacking play in time-trouble led to an ending where Luis had a queen and two pawns vs. two rooks; after the exchange of the heavy pieces, the pawns made his days. With this 3-1 win, Europchess 3 is now on 3rd rank in Division 4 E.
The fourth team booked another easy win against Wavre 4. While Marcello Ranucci drew on the top board with Yohan Burignat (1705), Jesper Abrahamsen, Thanos Gkionis and Nikos Zaimis all won their games against Vincent Coutton (1672), Doryan Burignat (1291) and Maxence Coutton (1081), respectively. In Division 5 L, E 4 has now climbed up to the 3rd rank. While Sergio Serrano Semper (on board 2 against Dries Heremans, 1770) and Ioannis Grammatikopoulos (on board 3 against Stefan Roosen, 1672) had to give in early on, Robert Prylinski (against Thomas Massoels, 1946) and Roberto Teichner (Antonia Simek, 1499) put up a long fight. On board 1, Robert gained with Black some space advantage after the opening with good play on the kingside, but lost the exchange in the middlegame due to a fork. He held the position up to the endgame where the material advantage finally decided the game. On the fourth board, Roberto held a good draw against. In a complicated ending Roberto re-gained Black’s extra knight by pushing his passed pawn, leading to an equal endgame with only kings and rooks left on the board. E 5 is now in the middle of Division 5 M on rank 6.